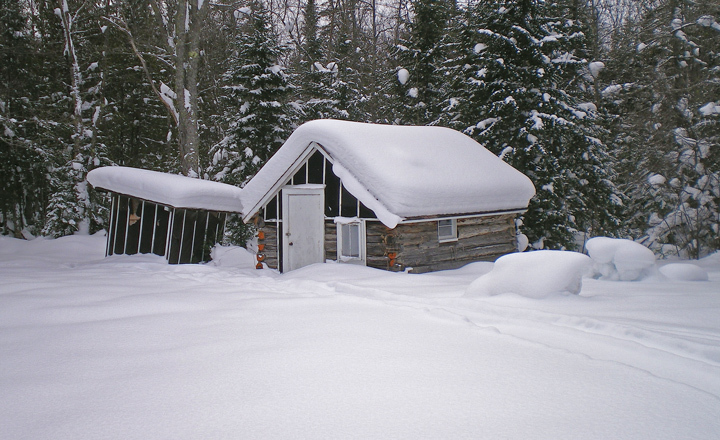 This past weekend we took a skiing road trip to the U.P. of Michigan. 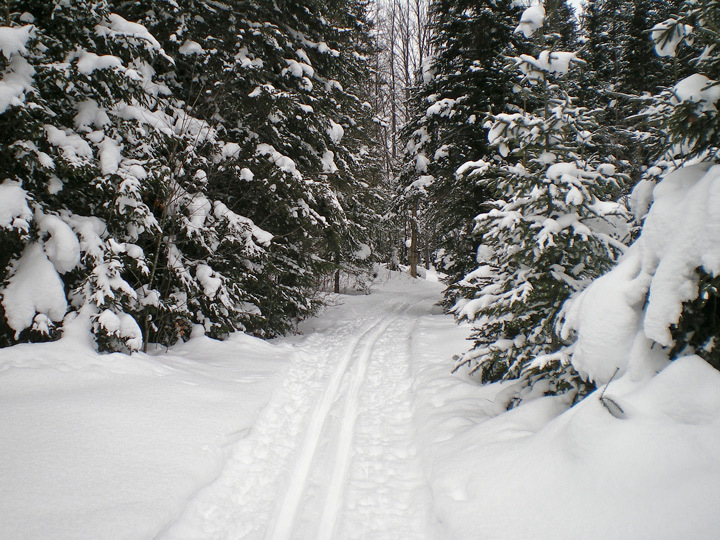 Our goal was to ski Keweenaw Mountain Lodge Ski Trails and the Swedetown Ski Trails. 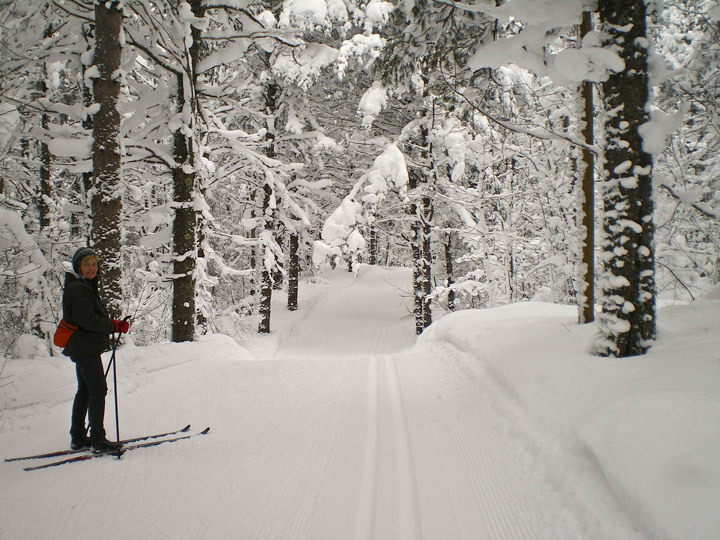 On the way up to Calumet we stopped at the Miljes Ski Trails to get some quick exercise. The first problem was finding the trails. They are located about a mile south of Wakefield on highway 519. Unfortunately we couldn’t find any markings for highway 519. After asking at a local gas station (they weren’t sure) we stopped at the state patrol office a found out the location. At the intersection of highway 2 and 28 (the only stoplight in town) drive south through the downtown and continue for about a mile (you finally see a sign for 519 after leaving town). You will see a large sign for the trails on your right. The trails have a new warming hut. A sign in the hut indicates that it is under construction and will be finished this year. There are rooms to change and several couches and comfortable chairs in the hut. It includes a table and chairs as well as a kitchen. There is a stove with firewood which you can use. This is a shot of the old warming hut which was formerly a herders cabin. The blurb on skinny ski indicates there are 14 km of trails. 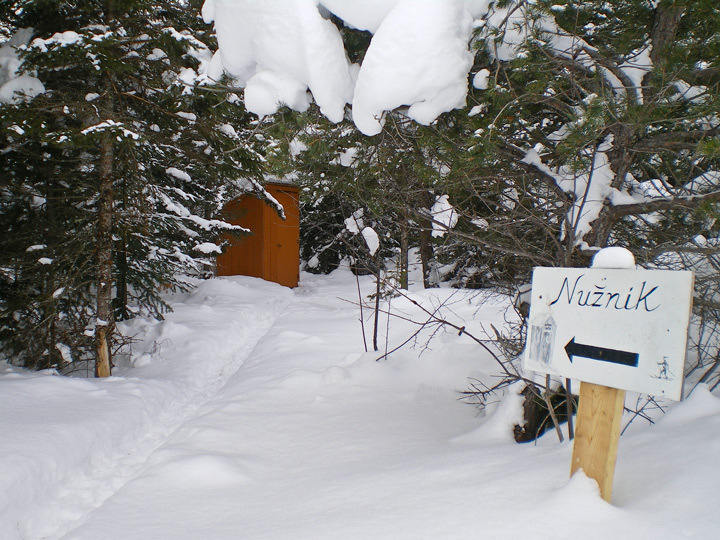 The trail map on skinny ski indicates 9.2 km and the map on the warming hut indicates 6 km of trails. I believe the map in the hut and we were a little disappointed to find the trails were not as extensive as we were led to believe. Skinny ski indicates there is a $10 dollar trail fee. When we finally found the donation box (it was about 100 feet down the trail) it said $7.00. Fortunately one of us had kept our money out so we could pay the fee. The trails are gentle classic through a mix of hardwood forests and cedar swamps. This is a family run ski area and apparently the family has a Serbian and Finnish heritage. Many of the signs along the trail are in these languages. 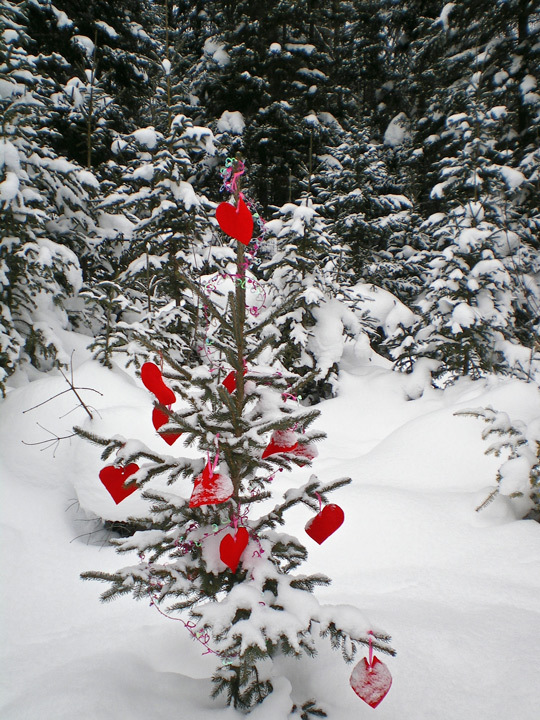 There were some local touches with a small Christmas tree decorated and later we found a tree decorated for valentine’s day. The biggest problem was fact that the map on the internet did not match the trail system. The trail off to the northwest was as marked on the map and easy to follow. However the trails off to the southwest did not correspond to the map. My wife had picked up a map from the hut and it wasn’t until we became lost that we realized they were two entirely different maps. The southwest trails had been converted to a series of small loops. Unfortunately none of the trails were marked so when you came to 5 intersecting trails you had no idea which way to go. Since the trail system is so small you can’t get lost but the trails are in serious need of some trail markings and some maps posted along the way. I noticed in the log book that a number of people have commented on this. This is probably not a place I would ski again, mainly because there are not enough trails and it is a bit pricy. The experience would be improved by developing a few more trails and marking the trails better. It is a bit off the beaten path and would likely be a fun place to spend skiing with the family. A morning ski followed by a visit to the warming hut and an afternoon ski would be enjoyable. An updated report from 2012 is available on my Blog. 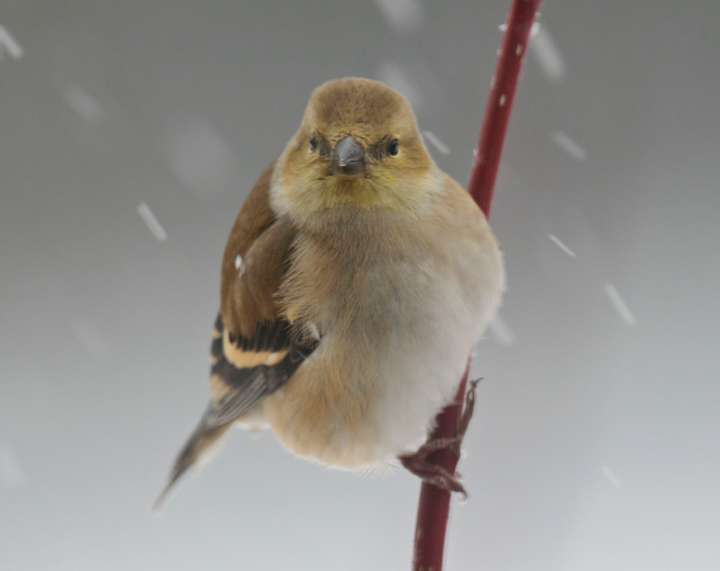 Every year is different at my bird feeders. 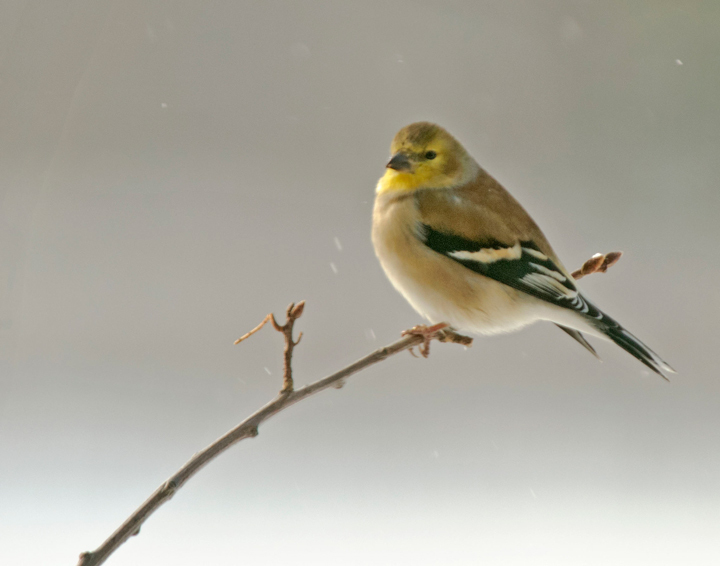 I’ve usually had a few American Goldfinches around the feeder although one year I didn’t have any. I thought my feed was bad so I gave some of it away. 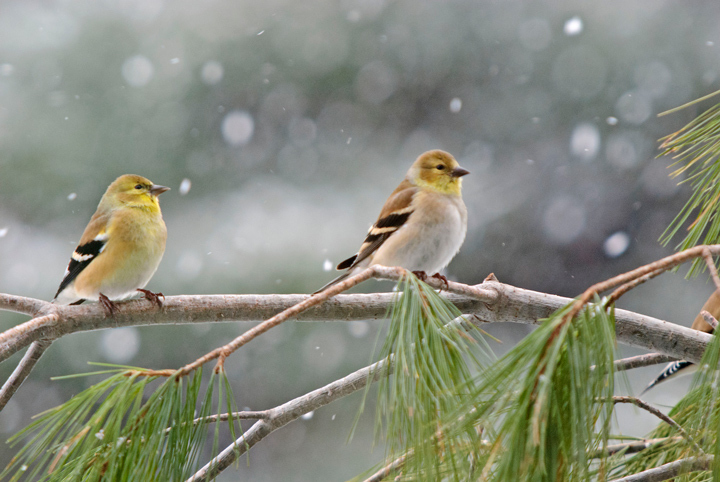 I’m still using the same feed but this year I’m overrun with Goldfinches. I’ve counted as many as 50 at the feeder at any one time. One reason might be that we have had quite a bit of snow this winter including an early storm that dumped over a foot of snow on the area. They are definitely fun to watch. They usually show up at the feeder in waves. A few will come in to check things out and then a wave of 10 plus birds will come in usually followed by several more waves. Then all of a sudden they will all takeoff only to start returning again in a few minutes. 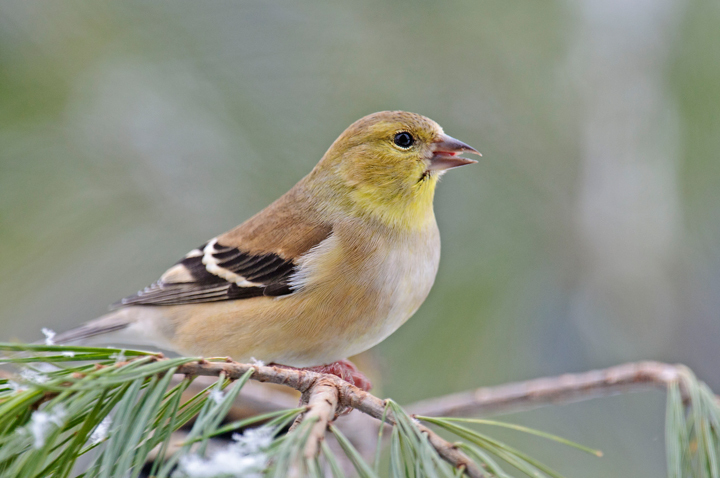 For more American Goldfinch Photos go to my website and click on search. When the page appears click on photos. My most frequently photographed waterfalls can be found at Amnicon Falls State Park . There are a couple of reasons for this. First, Amnicon has a great many waterfalls in a very small area offering a wide range of photographic opportunities. Second it is located at a critical junction along a couple of haveily traveled roads. When I drive up to the Minneosta North Shore I drive right past Amnicon so I usually stop. When I drive up along the Wisconsin South Shore of Lake Superior I usually stop. This past week I took what started out to be a road trip to the Minnesota North Shore. The weather forcast said we would have a couple of days of partly cloudy skies. Just what I was looking for. Unfortunately the closer I came to Lake Superior the more overcast it became. By the time I reached Superior, Wisconsin it was overcast with some light snow falling. I decided to cut the trip short and spend some time photographing in Amnicon Falls State Park and Wisconsin Point since they are located very close to one another. My first stop at Amnicon is usually the Covered Horton Bridge and this trip was no exception. This is an example of a bowstring bridge designed by Charles M. Horton. 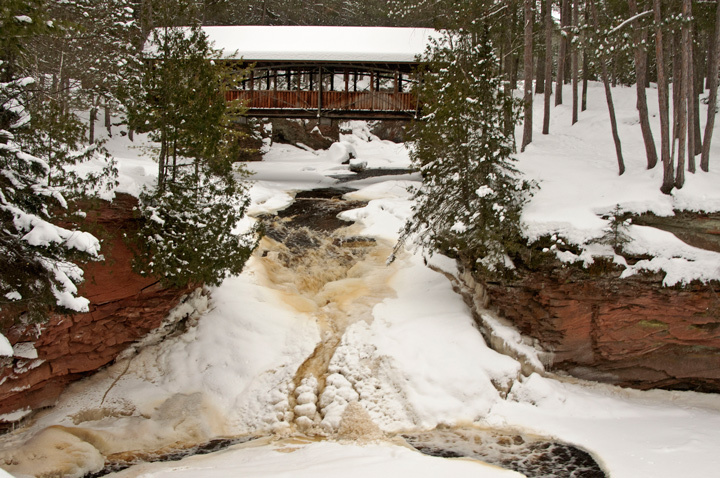 It was originally a highway bridge spanning the Amnicon River. It was moved to it’s present location in 1930 and a roof was added. It is a popular photographic locations spanning Lower Amnicon Falls. I was a little supprised to find so much water flowing in the river given the recent cold weather. In December 2007 I started participating in the Photo-a-Day gallery on my website. Over the years I managed to post a new photo almost every day of the year. In most cases I post photos a day or so after they are taken because I have several cameras and don’t upload my photos for processing every day. It is fun to look back over the years to see what I was shooting and it is always fun to look back and see what shooting opportunities I will have in the coming month. Check out my Photo-a-Day photos. 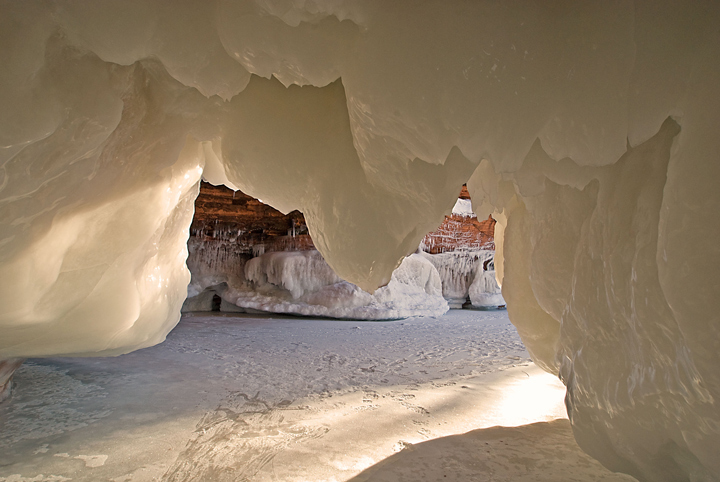 I had mentioned in an earlier post one of my favorite winter photography locations is the Apostle Islands Ice Caves. I’ve made the trip to visit the caves every year since 2007. Unfortunately last year the caves were not accessible because the ice never firmed up along the shore. My website is starting to get daily hits from folks starting to think about visiting the caves. If they open this year it will likely happen in the first few weeks of February. I can feel the excitement in the air and can’t wait for the caves to open. 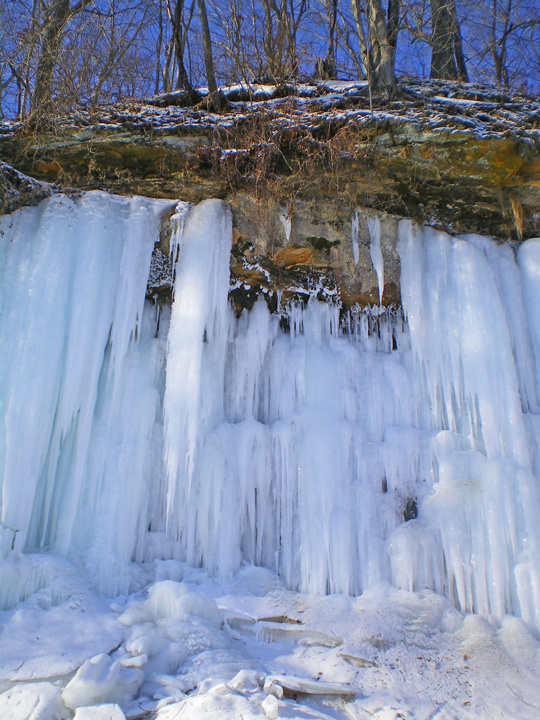 Every year the ice formations are different and they vary over time so you can plan for more than one visit and see something different each time. This is a photo from my visit in 2007 to the caves. It shows some of the extensive stalactite formations that can be found on the ceiling of the caves. 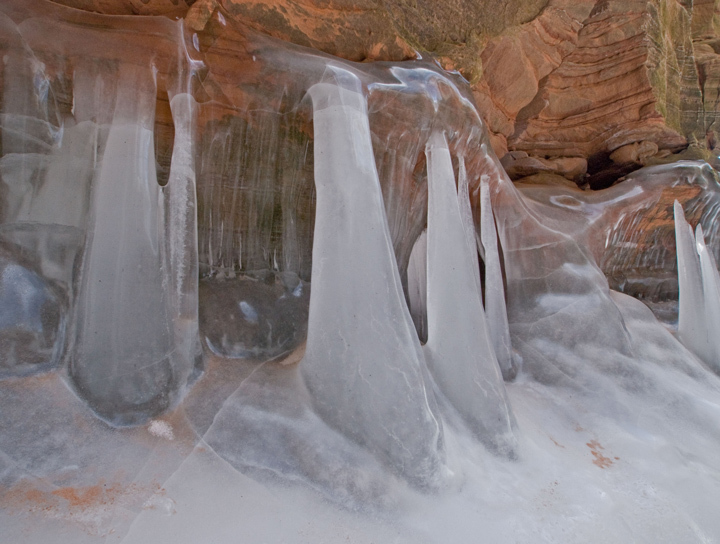 They are caused by ice seeping through the sandstone formations. This is a photo from my visit in 2008 shows some of the ice formations formed by water running down the face of the sandstone formations along the shore. 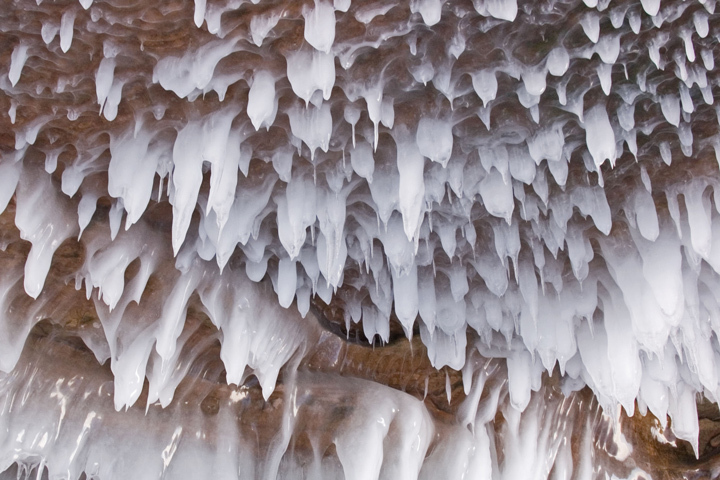 This is a photo from my visit in 2009 shows the caves themselves coated with ice. You can find more photos from the Apostle Islands Ice Caves on my website. Last weekend we drove up to Houghton, MI in the UP of Michigan for a weekend of cross country skiing. On Saturday we skied at the Michigan Tech trails, On Sunday the Swedetown trails and on Monday at ABR in Ironwood. This was our fourth time skiing at Swedetown and these are my favorite cross country ski trails. Swedetown had 12 inches of fresh on Saturday. We lucked out because the grooming equipment had broken down but they managed to get it fixed and most of the trails were groomed by early Sunday morning. The trails themselves are relatively easy when compared to the trails found in northwest Wisconsin. Their black trails are about what we would classify as blue. They do a great job of grooming the trails under heavy snow conditions. 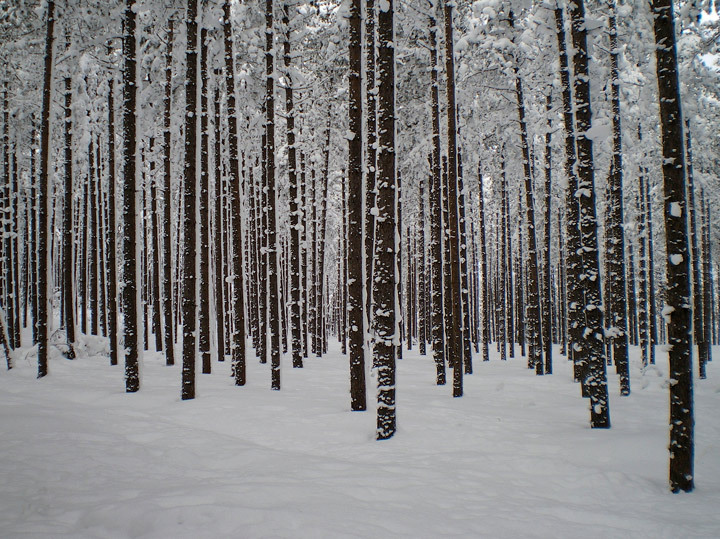 What I really like about the trails is the amount of snow and the way it hangs on the trees. You have to see it to believe it. They also have one back country trail that is occasionally groomed with a snowmobile but it left ungroomed most of the time so you can usually break trail on it. It is a fantastic ski after a heavy fresh snow. It was a beautiful sunny day in Menomonie. I had a chance to visit some of my favorite winter haunts. The first stop was at Devils Punchbowl. The steps are a little icy after the recent rain so it is best to wear some form of traction device on your feet. The Ice wall wasn’t it top winter form. For some reason it looked a little ragged. The worst part is that tree has fallen down from the top of the wall and is hanging over the best part of the wall. Looks like it will be with us for most of the winter. 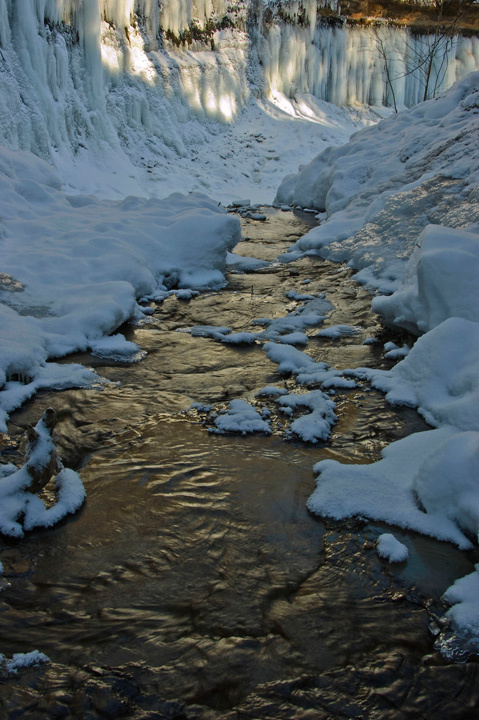 The photo is from the little stream that flows through the area. The second stop was Paradise Valley. 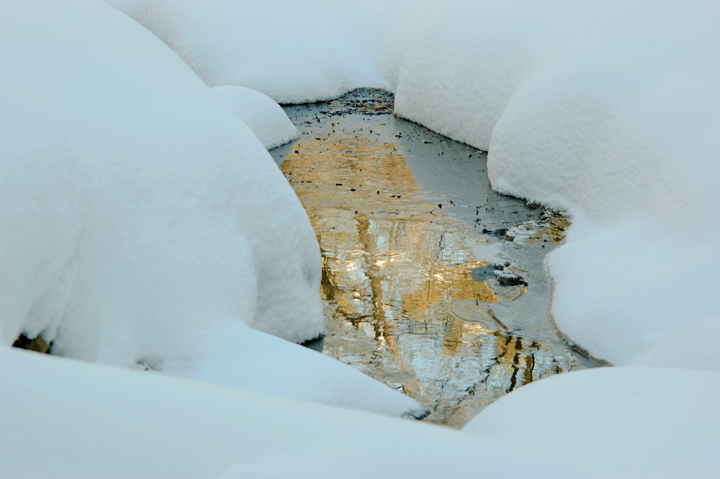 I was hoping for some nice ice formations along the stream but the recent light snowfalls have covered up the ice. The Ice wall looks good and there is enough snow along the left side of the waterfall so you can walk up the valley to view some more little falls. The photo is from the top of the waterfall looking back down the valley. Again traction on the shoes is recommended. Skied from Menomonie to Irvington on the Red Cedar Trail. The trail is great for skate skiing with a nice firm base with a little snow on top. The classic track ends at about the 3/4 mile marker where the tracking equipment broke down a few weeks ago. Up to this point the track is very good. Beyond this point the classic track has been skied in and varies is quality. This shot was taken in the morning along the ice wall. This past fall I spent a considerable amount of time working on Photoshop. The fall is when I take the most photos and also when I actually process the largest percentage of photos. Gradually I started developing a severe case of tennis elbow. At that point I should have probably stopped working with Photoshop but I had so many photos to process that I kept on going. I finally finished processing the fall photos in the middle of December. The tennis elbow became so bad that I started looking for some way to reduce the number of mouse clicks since that is what seem to have set off the tennis elbow. I recalled seeing a number of posts on some of the photography sites about the use of a pen and tablet so I spent some time looking around to see if that was a viable option to reduce number of mouse clicks. I noticed that a number of photographers had also complained about problems with repetitive mouse clicks and had found that a tablet helped. I started searching the photography blogs for information on tablets and found that most photographers recommended the Wacom Tablet. I checked out the Wacom site and found they offered a wide range of products. I was a little overwhelmed at this point. Recommendations varied widely regarding the size of tablet you needed and the features they offered. I decided to call up the local university to see if they were using any tablets and if I could stop in and try one out. They were using a Wacom medium INTUOS4 so I made arrangements to stop in for a test run. I pulled up a photo and started to work on it using my normal work routine. It quickly became clear that a tablet would greatly reduce if not eliminate the use of the mouse and hopefully help my tennis elbow. The major questions I had was what level of tablet would work best and what was the best size. The latter question was quickly answered during my test and subsequent conversations with university staff. The working space on the tablet corresponds to the monitor. If you want to click on File>Open you have to move the light pen to the upper left of the working space. One of the questions I had was how big a tablet did I need? The university had a medium and I quickly realized that the smaller the tablet the more efficient it would be to work with because there would be less arm and hand movement required. I came back home and started looking at the options on the Wacom site again. I ended up ordering the INTUOS4 small tablet. It included software, pen, mouse and tablet. The tablet dimensions are 12.2 by 8.2 inches and the working space is 6.2 by 3.9 inches. It has 6 express keys and a user controlled touch ring with four functions that you can program. You can check out the Wacom website for more details on this model. Installation was a breeze. I’m using Windows 7 and it took less than a half hour to get everything up and running. It took just a few minutes to install the software. The tablet comes with two 6 foot cords that plugs into a USB port. One is for left hand users and the other for right hand use. I connected the cord and I was in business. I programmed the express keys to do what I wanted which was shift, ctrl, alt and backspace. The light pen is extremely easy to use and I had no difficulty switching from the mouse for most of my work. I even use the tablet when I’m just surfing the web. After using it a while I discovered that the tablet is small enough to set on the right side of my keyboard. This provided me with access to most of the keyboard keys so I continued to use the sift, ctrl and alt functions on the keyboard rather than the tablet. It’s a matter of choice. Photographer reviews differed on the size of the tablet required and ranged from the larger the tablet the better to the smaller works fine. My conclusion is that a larger tablet might be nice for someone doing art work or graphics design where flowing strokes are required but the smaller one is much better for photography. The small tablet requires much less had movement and is more efficient. I’ve almost eliminated the use of the mouse and keyboard in working with photos. I have all the controls I need with the tablet. I need the keyboard when naming photographs but now I wait until I’m done processing a batch of photos then go back and rename them using the keyboard. I think the pen and tablet is much easier and more efficient to use for editing photographs in Photoshop and I wouldn’t go back to the mouse. My Tennis Elbow is gradually going away now that I’m not using on the mouse so much.